While there are many ways to create a bit of atmosphere in your back yard, one of my favourites is to add some lighting. The right lights can turn a garden that’s a little bit dull by nightfall into one that’s truly a delight to be in. There are a lot of options out there depending on what your aim is; whether you’re trying to create a bit of romance, bring a design element of your house to life or add a bit of depth to your yard there’s a lighting option for you. Belinda, owner of the The Fairy Light Shop recommends the top thing you look out for when purchasing outdoor lights is that they are UV stabilised to cope with New Zealand harsh conditions. Water Features aren’t just nice to look at; they add texture, sound, movement and life to your back yard. The sound of running water is relaxing (think sitting by a stream) and the availability of fresh water brings birds of all sorts and colours to your space. When thinking about installing a water feature; Mike, a 20-year veteran at Water Works Irrigation recommends investing in a quality pump. These can reduce your running costs as well as last 2-3 times as long as cheaper options. A little bit more money up front means you’re better off in the long term. Is your patchy, scratchy piece of turf getting you down in the dumps? Replacing your balding lawn with a premium & lush grass is one of the biggest transformations you can make; your lawn after all, is the largest thing in your yard. While Mother Nature provides the sun, rain and air your lawn needs, Jeremy from The Lawn Laying Company (a former BCC editor, turned horticulturist) can provide the advice. Jeremy’s hot tip is that an immaculate looking lawn does not have to be expensive. If you’re not in a rush, hydro-seeding technology provides an excellent result (even when compared to ready roll-on lawn) and is much cheaper. If your back yard is suffering from a distinct lack of personality one of the best way to transform it is to include some plants! A splash of greenery can enhance a space, and there are literally so many plant options out there depending on the look you’re trying to achieve. Modern gardening options like the Prai Vertical Garden System, can change a space in under an hour and are a smart choice when space is at a premium (or there’s a really ugly wall or fence to hide). When we asked Lara (the lovely mastermind behind Cool Plants) how she narrows down the plant options; she said; an often-overlooked aspect of plant ownership is matching the right plant with the right owner. If you’re as botanically challenged as I am, she’ll match you with ones that can handle your version of loving care. Busy schedule? No problem; there are low maintenance plants available. 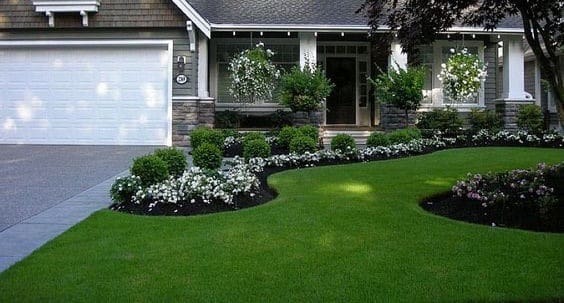 A well-designed path should do more then just link your space physically; it should also link it visually while protecting your lawn from weight bearing damage after heavy rainfall. 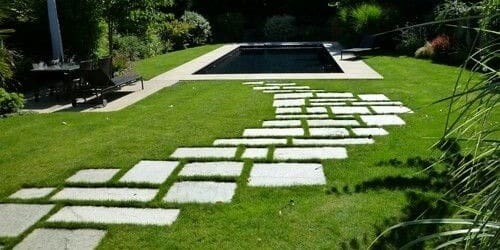 Straight edge paths are good for more formal looks, if you’re after something a bit more casual you can place plants on the sides of the path or opt for a curvier look. The great thing about installing a path is that it can quickly transform the look of your property; says Alistair from PaveMaster, but before you start make sure to check with your local council. City councils have a requirement for the amount of permeable land versus non-permeable land on your property so make sure you check before you build and use a permeable paving type if you’re at your limit.